Alkimos is named after a Greek ship that was wrecked off the coast in 1964. The vessel broke anchor and was driven onto the Eglinton Rocks, after which the partly dismantled remains sat in several metres of water before gradually disintegrating and sinking. It is now a popular diving venue. The Alkimos sea journey begins with a deliberately rusted steel anchor nestled in the garden bed at the entry to the school. Mehdi has carved a medley of sea creatures that divers might expect to meet on their journey down into the depths of the Alkimos wreck. Students and adults alike can sit on, hug and play with larger works placed in the grassed courtyards. The hermit crab, Australian sea lion and green turtle have each been rendered with anatomical precision, as have the sharks, fish, dolphins, squid and turtle on the five wall pieces to assist with navigation through the school site. The sculptures are carved from Donnybrook sandstone and the sandy colour with subtle lines evoking dunes and shore running through makes it the perfect medium for ocean inspired artworks in a beach side suburb. New sculptures by Mehdi Rasulle. Carawatha Park is a children’s nature playground with hidden sculptures waiting to be discovered. The artworks are named “Bushland Hide and Seek”. This article By Sharon Kennedy originally appeared on the ABC website on 23 April, 2015. 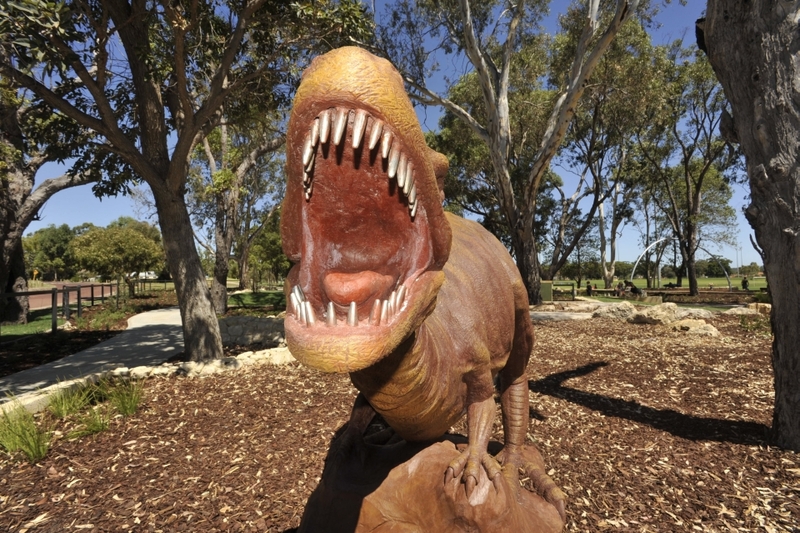 Undertaken by the City of Bunbury with the aid of a Federal Anzac Centenary grant, a major part of the restoration entailed replacing sections broken from the head of the sculpture. Monumental stonemason Mehdi Rasulle used marble from Afghanistan for the remodelling. Mehdi was 16 when he arrived in Western Australia in 2001. A refugee fleeing the Taliban, injured and alone, he left his family behind to undertake the perilous journey via Indonesia. Once granted refugee status in Australia, he was able to return to school and planned on becoming an architect. However, the family tradition of stone work wasn’t so easy to discard. Descended from a long line of stone carvers, Mehdi increasingly found his skills in demand for heritage work. The soldier keeping vigil on top of the memorial was missing the right side of the hat brim. The nose was broken and the face had sustained other damage, probably from thrown stones. Before Mehdi could begin remodelling, the statue had to be relieved of over 20 coats of paint. Paul Rees is the director of Clinton Long Project Management, the heritage restoration company which undertook the refurbishment. As a consequence, sandstone will de-crystallise and the surface will crumble and pit. Previous cleaning attempts had caused other disruption. At one stage, an axe and chisel had been used to gouge out graffiti and high pressure hosing had exacerbated pitting on the surfaces. Stonemason Jamie Kallarn led the team charged with removing the old coatings. Test panels revealed not just the annually applied coats of white paint but also some coloured layers, says Jamie. Three applications of a very mild chemical were needed, though in most areas, it was possible simply to peel paint off because of the crumbling surface beneath. Once the stone had been denuded, the restorers could gauge the extent of the hidden staining and damage to the plinth itself. Invisible repair was not the goal of the restoration according to both Paul Rees and Jamie Kallarn. “The idea is to recapture the materials and the intention and the technology that was used at the time the monument was created,” said Paul. Imported natural hydraulic lime was used to fill some of the gouges in the plinth. Actual sandstone replacement was kept to a minimum. Once the paint had been removed, Mehdi Rasulle could begin the detailed sanding work needed on the statue itself which showed signs of fine surface crumbling. He needed to restore a smooth hard finish which would resist salts and pollution. Fine details on buckles and rifle and wording on the shoulder epaulettes called for careful attention. For the minor damage to the face, Mehdi used crushed marble to remodel eye, cheekbone and nose. Taking up marble he had previously brought from Afghanistan from the family quarries, Mehdi sculpted a new hat brim. To attach it, he first sanded back the cratered broken surface. Stainless steel rods provided structural integrity and the piece was finally rejoined to the hat using matched marble glue. “I’m very proud of the job,” says Paul Rees. “It’s beautiful to have the opportunity to participate in a job that is so historically significant at this time. “Now that the stone is in its natural state and able to breathe, it won’t degrade as it did under the plastic film of the paint. Work on the memorial done, Mehdi Rasulle is currently working on a University of Western Australia building. 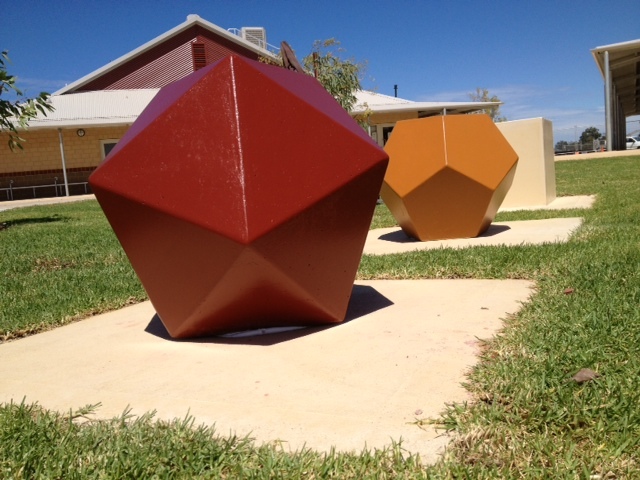 Mehdi Rasulle has created a new sculpture for West Byford Primary School called “The Solid Sisters”. 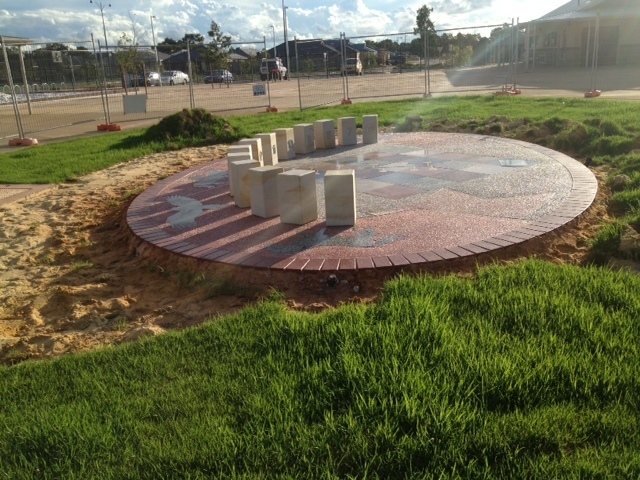 Mehdi Recently created and installed a new Sundial Sculpture at the West Byford Primary School. A NEW piece of public art by a Queens Park artist has made the triple achievement of being pleasing to the eye and functional while also acknowledging the local history of the area. Mehdi Rasulle was quite rightly beaming with pride as his Tram Bus Stop public artwork was officially unveiled by Town of Victoria Park Mayor Trevor Vaughan last week. 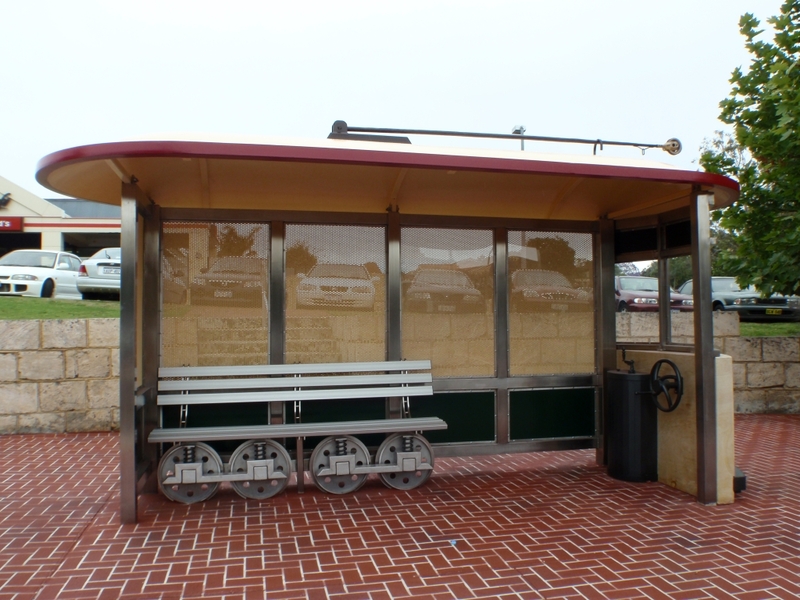 The artwork is a functioning bus shelter on Albany Highway that cleverly incorporates design elements of a tram, to reflect the history of the tram service that used to run through the area. The site was originally the end stop for a tram that ran through Victoria Park from Perth CBD to Welshpool Road from 1905-1951. A tram carriage bus stop had been at the site for many years but wear and tear saw it replaced with a standard bus stop in 2008. Key pieces of the original shelter were salvaged and incorporated into the new design. Rasulle operates under the business name Sculpture Sitoara and has other public artworks at schools and churches around Perth. The Town has commissioned him to produce another public artwork, which will reflect the history of Broadway Theatre. Now I want to tell you about a Taliban fighter who used to work for me for a little while. You should go have a look at some of his work. He sculpted a big eagle for me—a giant eagle for Aquila—because I was a megalomaniac and owned wineries before I learnt how much money you lose! He did a beautiful job. He also carved Joseph in jarrah for the Catholic cathedral. His name is Mehdi Mohammadi. He has gone back to Kabul in Afghanistan for a short time. They tend to grab his brother every time he goes there and take a lot of money from him, because it is all corrupt. But that is life. How he started as a sculptor and a painter—as are other members of his family—is that his uncle and his cousin made a beautiful sculpture of a human being. The Taliban caught them and had a problem with that so they killed his uncle and his cousin. He was conscripted—and conscription there is not waiting for your marble or ball to be picked; it is being told, ‘We’re going to shoot you if you don’t cooperate’. He was probably lucky because he was wounded within a year or so of that and they left him in a cave to die. He was one of the guys who got out of Afghanistan as a boatperson, an asylum seeker, came to this country and survived— with a bit of scarring. He is now an Australian citizen and you can look at his works, as I said. He has changed his name to Medhi Rasulle. He has told me of the lunacy of what we are doing there. He is about as religious as I am. He is an incredible guy—he had no English when he came to this country but in a short time he could speak fluent English. He is an absolute genius when it comes to sculpting. However, Afghanistan is a land of tribes—it is not a country where people are identified as Afghans although they might call themselves that. It is a land of tribes ruled by tribal warlords, some of them drug dealers and some of them Taliban or whatever you want to call them. We chase them to Pakistan and they come back. We all know this war is lost, except for the people who have never been there. G knows it is lost. Mehdi knows it is lost. What we need is to get some government that is not a democratic government but that is representative of the tribes, the warlords and all the others there so there will be some stability when we leave. When should we leave? If we cannot do that in six months I think we are wasting our time. Forget the 4th Brigade—they have enough warlords and armies to take on whatever they want, but they just do not have the will to fight. If they do not want to fight for us then let us get our people home. *”Mehdi Mohammadi” is now known as “Mehdi Rasulle”. Dr Mal Washer’s speech can be viewed in it’s entirety here beginning on page 199. 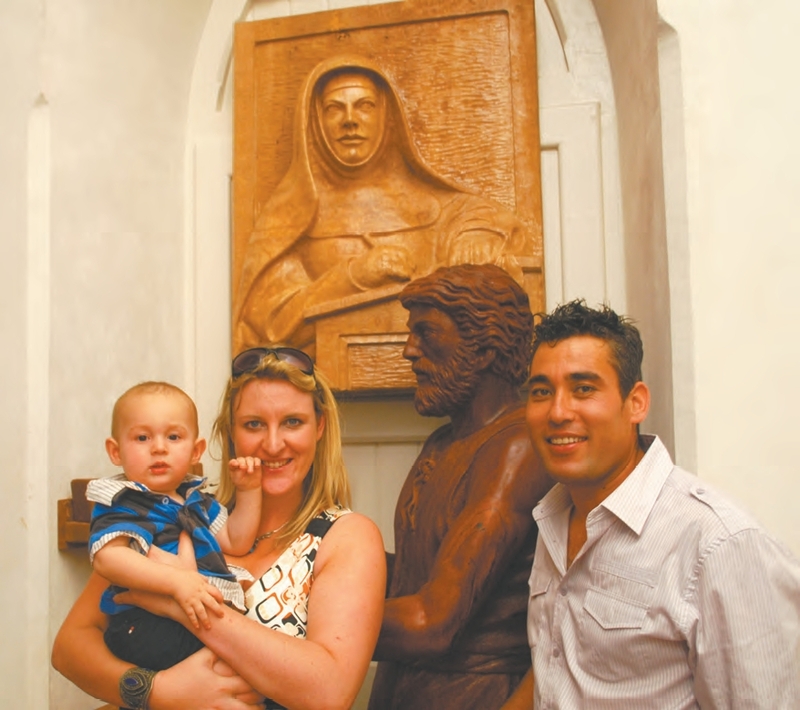 Mehdi Rasulle, the Afghan refugee who sculpted the statue of St Joseph the Worker and Blessed Mary MacKillop located just inside the main entrance of St Mary’s Cathedral, is pictured with his wife Joanne and 12-month-old son Eolann after Archbishop Barry Hickey blessed the images during a special ceremony on December 13. An Afghan refugee whose brother was executed by the Taliban crafted a statue of St Joseph the Worker in Perth’s Cathedral of the Immaculate Conception based on what he learned of the saint in Muslim studies as boy. Perth Archbishop Barry J Hickey blessed the statue in a special ceremony on December 13 at the Cathedral that was officially opened on December 8 after being closed for three years for a $32.9 million restoration and completion project. The sculptor of the statue is Mehdi Rasulle, 25, one of 11 children who was born in Kabul and arrived in Australia illegally by a boat crowded with over 200 people in 2001. Mehdi’s statue of St Joseph has words inscribed in Hebrew, that reads, from right to left, “Joseph, son of David”, referring to the term the angel used to address Joseph when appearing to him in a dream telling him not to fear taking Mary as his wife though she was pregnant by the Holy Spirit. Mehdi spent five and a half months at Curtin Detention Centre, located on the RAAF (Royal Australian Air Force) base north of Broome, WA before being granted a visa, and has now started a family with Joanne, an Irish woman. Though he keeps in touch with his family by phone, they are scattered throughout the Middle East. He has not seen them since he left on his own, but hopes one day to bring them all to Australia. His wealthy father ran a transport business until fighting broke out in the country over 15 years ago and he lost his job. His oldest brother Nik Qadem became a working and teaching artist after completing university and military service. Another older brother, Abbas, also took up art, but later gave it up under pain of death to become a panel beater. In 1996, the Muslim fundamentalist group the Taliban had taken control of Afghanistan’s government and ruled until the 2001 United States-led invasion drove it from power. These six years proved tragic for Medhi’s family, which belongs to the Hazara ethnic minority. Once the Taliban, of the Pashtun ethnic group, came to power, life became tough. As his oldest brother Nic Qadem, who taught him sculpting, also taught classical art which included the Christian-inspired Renaissance art, his whole family was charged with preaching Christianity – though they are Muslims. Though his family spent much time moving from place to place in hiding, his brother Nik Qadem was found, prosecuted and executed by shooting. “The same thing would have happened to me if I had stayed there,” said Mehdi, who has forged an impressive reputation in WA as a sculptor artist, though depicting living things is against Islamic doctrine which would have made him a Taliban target back home. He was commissioned by Aquila Estate’s cellar door outlet in Carabooda, WA and has been awarded many public contracts and private commissions, including his latest, by Perth Archbishop Hickey himself. When Mehdi drew a sketch of St Joseph from what he’d learned as a child of the saint as the father of Christ, who in the Muslim faith is a highly regarded prophet, the Archbishop loved it. Mehdi also crafted the image of Blessed Mary MacKillop above the statue of Joseph the Worker. Sister Pauline Morgan, head of the WA Sisters of St Joseph of the Sacred Heart, told The Record after the ceremony that the Sisters were “really pleased” that their foundress received pride of place in Perth’s Mother Church. 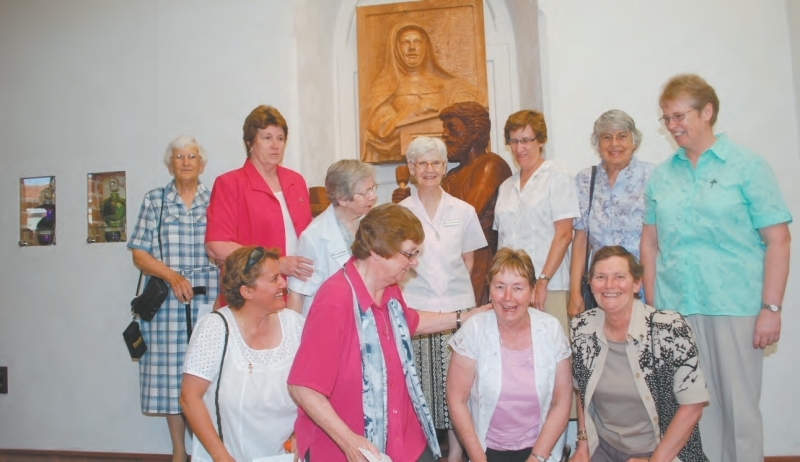 “With the imminent canonisation of Mary MacKillop, it’s important that people know about her,” said Sr Pauline, who was appointed was WA leader of the congregation in March 2008. Josephite Sisters Joan Liff, Katherine Hitchcock, Anita Gallagher, Gemma Scott, Pauline Morgan, Margaret Kane, Kathryn Summerfield (top row), Julian Della Franca, Maureen Hodge, Eileen Johnson and Gail Lambert (bottom row) with the image of their foundress. The Sisters are preparing for her expected canonization in Rome in 2010. Perth is one of the few places Blessed MacKillop did not visit, though she did set foot in Albany, in the south-west of WA. In her last ‘sending out’, Mary MacKillop sent a group of her Sisters to the monastic town of New Norcia in WA to teach in 1906. Archbishop Hickey said during the December 13 blessing of the statue at the Cathedral that St Joseph is more than the man charged with bringing up Jesus – significant though that role was. “There is much biblical importance to him, as the prophecy in the Old Testament said that the Messiah would come from the House of David,” Archbishop Hickey said. During the service, Archbishop Hickey handed all the contract workers who had worked on the Cathedral a pouch containing a medal inscribed with his signature and an image of the Cathedral. During a special acknowledgement of the workers, the Archbishop said that the project became a labour of love for many of them, and some had told him personally that it was a privilege to work on such a sacred building. “The workers took great pains to finish it in the best possible way,” he said, “with love, skill and devotion, as they knew it was a sacred building. Mehdi Mohammadi* tells his story calmly, without tears of sorrow or rage, using the simple English he has learned in the past couple of years. At 18, he is a sculptor working on a commission at Aquila Estate’s cellar door outlet in Carabooda. He is also a refugee from Afghanistan. Hearing the tale which links these lives is an experience to challenge the imagination at least for those people who have known nothing of war and persecution. Mohammadi says he was born in the capital Kabul as one of 11 children. His wealthy father ran a transport business until fighting broke out in the country about a decade ago and he lost his job. His oldest brother, Nik Qadem, became a working and teaching artist after finishing university and military service. Another older brother, Abbas, also took up art and Mohammadi followed. The family belongs to the Hazara ethnic minority and once the Taliban (of the Pashtun ethnic group) came to power in 1996, life became more difficult and dangerous. For artists it was especially fraught; the fundamentalist regime – which infamously destroyed two giant statues of Buddha in 2001 – saw the depiction of living creatures as un-Islamic. Nik Qadem was killed by the Taliban, and Mohammadi gave up art to work as a panel beater. It was even frightening to go to a shopping centre, he remembers. And that’s precisely what happened to him and several others captured and spirited away from the panel beating shop into the mountains, he says. On the fourth night of carrying ammunition they were caught in a fierce battle. Mohammadi heard a big bang behind him, and woke up later in a cave. He was injured – with schrapnel in his back – as was a friend who was there too, crying. Another friend was dead. They were then deposited at a mosque, where his family came to retrieve him. A doctor friend of his father helped Mohammadi to recover. His father, by then in hiding but returning to the family home at night, arranged for his escape. He told his 16 year old son to go with a friend who sold carpets into neighbouring countries. Travelling with the carpets in a van he arrived in Peshawar, and then Karachi, in Pakistan. A people smuggler made him a passport and from there he flew to Malaysia and then Indonesia. He says he had been there about 18 days when he was told he would be going to Australia . He had no real concept of the country, beyond vague images of kangaroos and beaches. The first time he saw the ocean was on the night he was about to board a fishing boat bound for Australia. But back to the story, and the boat. There were more than 200 people crowded on board. He likened them to the sheep he’s since seen ready for export at Fremantle. Eventually, what appeared to be a dark cloud rose in the distance – Christmas Island. From there he was transferred to the Curtin detention centre, near Derby. He remembers not understanding what they were guilty of,”and there was a prison”. Some officers were good, he says, but others treated people badly. And there was no knowing how long you would be there. People were angry, fighting and even asking to be sent home. Mohammadi says he decided it would be best to try to learn English. When his teacher left the centre, an Iranian detainee took up the basic lessons. After 4 ½ months, in October 2001, he was granted a three year temporary protection visa. He has since applied for a permanent one. He was brought to Perth, where he began living with fellow Afghan refugees. He studied at high school until he turned 18 last year. One day, Russell turned up to visit one of Mohammadi’s housemates. At the time she was running tea rooms in the strawberry farm in which this friend worked, and had been helping him and others with their English. She asked Mohammadi about his hobbies and he explained that he painted – “actually I’m not a good painter” – and sculpted. He showed her a painting. She took him to see renowned WA artist Leon Pericles to get some guidance. Helping him reach his artistic potential has become almost her full-time project since she sold her tea rooms last October. “The pay is s…,but the work’s terrific,” she says with a big laugh. The eagle commission will give people a chance to see his work. In his sculptures he says he is trying to show the beauty of nature and the stone. In Afghanistan his brother had told him you could turn stone to gold, and make it valuable. The “West Weekend Magazine” is a trademark of West Australian Newspapers Limited 2009.